1. 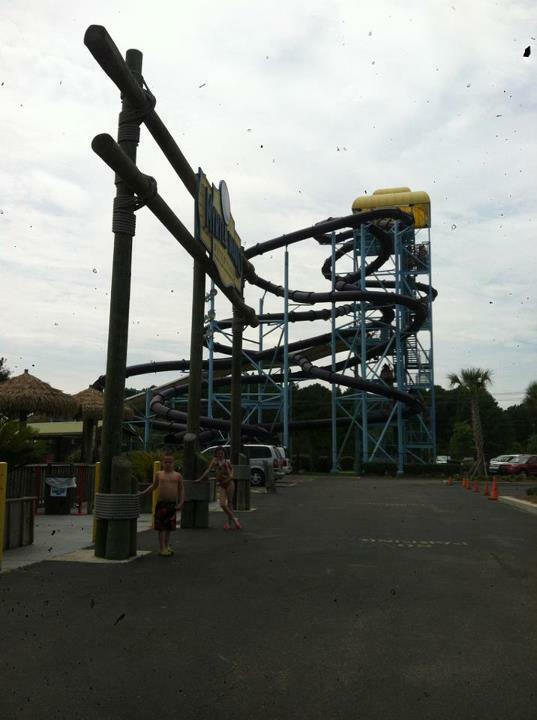 Kendra and Max rode the highest water slides at Myrtle Waves. Max wanted to ride it so badly, but he was terrified to go up the stairs. Ronnie held one hand, and I held the other, and he cried the entire way up out of sheer terror. But, he kept going. When he got to the top, he rode that slide, which is an intense water slide – he barely even met the height requirement to ride. He loved it! They both did. As soon as it was over, they both pranced right back up the stairs to do it again. Those were some high slides! 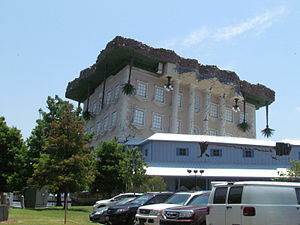 I would have never gone up there if the kids didn’t want to! 2. One night we were there, the pools were closed because of lightning. 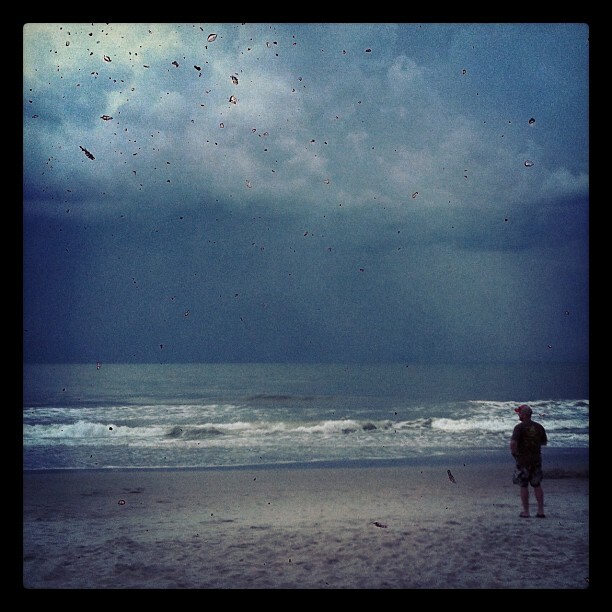 We went down to the beach and watched an incredible storm over the ocean. The kids played in the sand while Ronnie and I watched the lightning show. It was amazing. The kids were so funny. They were “doing the ocean dance” – Kendra’s consisted of spinning in circles and high-stepping at the edge of the water, and Max’s was his usual monkey dance while chanting “doing the ocean dance” over and over. It was great. Ronnie and I even joined in so all four of us just totally let loose at the edge of the ocean over which was a massive storm. I felt so little and insignificant yet free at the same time. 3. The last morning we were there, Kendra wanted to watch the sunrise and she hoped to see dolphins. I set an alarm and we went down to the beach before most other people were awake. We sat side by side and watched the sun come up. Then, we saw dolphins. They were so close to the shore that Kendra really got a good look at them. I think we saw about twenty of them for a period of about ten minutes. Just as the last of the dolphins were leaving, the boys joined us, so our whole little family enjoyed the quiet of the beach at sunrise. It was really fun. 4. Ronnie held Kendra in the ocean, and I was holding Max. We were jumping the waves and laughing and playing. All of a sudden, Max pulled his foot out of the water, and shrieked. His foot was covered in wet toilet paper. It was so disgusting, but we all started laughing. I laughed so hard that I was completely helpless when the next wave came. It hit Max and me and we both tumbled all the way to shore. We were still laughing when we finally got back above water. 5. There was a bath house across from our campsite. When we came in from the ocean, I told the kids to go shower the sand off before I gave them real showers in the camper. I waited outside. Kendra came out fully dressed like a person should be after a shower and went inside the camper. When Max came out, he had the goofiest proud look on his face. 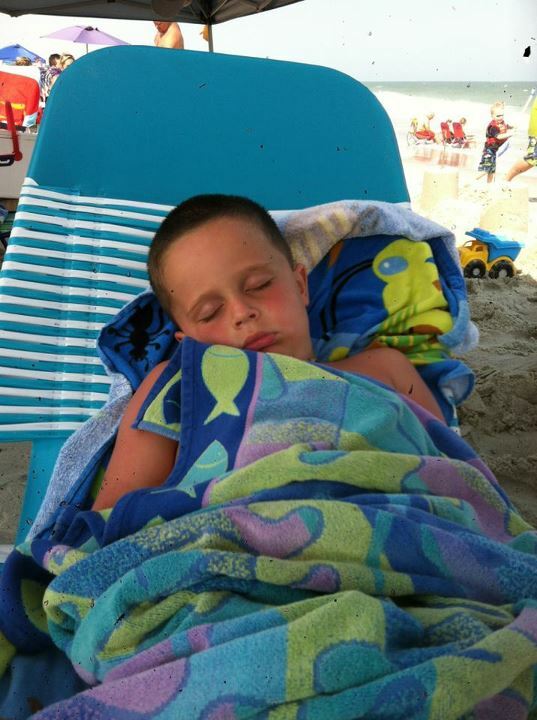 He was holding his trunks, and he had a beach towel wrapped around himself. Unfortunately, the towel was twisted into more of a belt than a towel, and he was holding it right around his waist. So, there came my proud naked son marching across the campground with a towel for a belt. I was laughing so hard that all I could do was scoot him along before anyone else noticed. 6. One night, we let the kids swim until the pool closed, and Ronnie and I just sat on the edge with our feet in the water to watch them. Almost all the kids in the pool were playing with a giant beach ball, hitting it back and forth. Ronnie asked one of the boys if he could hold the ball for a second. The confused boy handed it to Ronnie, and Ronnie grabbed it and took off running. All the kids in the pool were obviously confused as to why a grown man would steal their ball. I thought Ronnie would bring it right back, but he didn’t. Several uncomfortable minutes passed with the kids kind of aimlessly wandering around not quite sure what to do before Ronnie brought it back and threw it back in the pool. He’s so silly! 7. We took a nap every day. It was luxurious! 8. 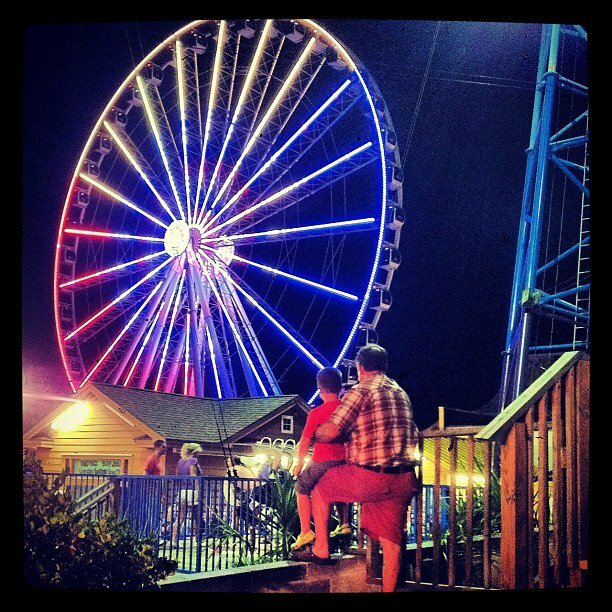 We rode the Sky Wheel in downtown Myrtle Beach. Once again, Max was scared at first, but he ended up really loving it. The views were amazing! 9. 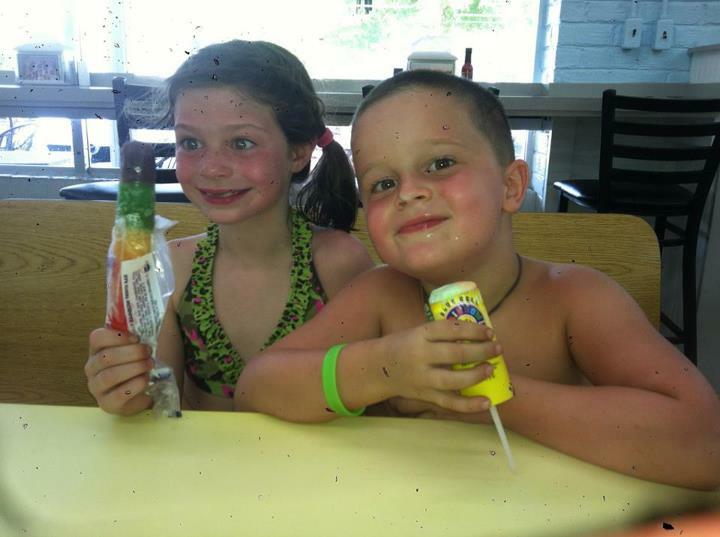 We let the kids eat ice cream for breakfast. I know they’ll remember that forever. When else can you eat junk food first thing in the morning? They were so excited to be allowed to do something that is so off-limits at home. 10. Kendra and Ronnie did the “Space Walk” at Wonderworks. Max tried, but he was too scared, so I took him back down. He and I watched Kendra and Ronnie do the high obstacle course. Kendra was barely big enough to reach some of the hand holds, and she was clearly scared at first, but she trusted her daddy and they did that course together. I was so proud of her! It was sure a great vacation! But I’m glad to be home.